Lots of bikes out today! Got to the first check in, nice snacks, including watermelon, Fig Newtons, Gorp, very good. Deerfield Dirt Road Randonee today! Looking round, most people have their racing bikes with slightly wider tires. Thorny should fare well. I hope to blog via Jott - we'll see how it goes! Today was the 2nd Bike Friday thing. Again, I started in Lexington and rode into Boston with the group. Last time was lots of fun, but definitely room for improvement. And I have to admit, that just about everything I suggested to the organizers was improved upon this time! Train escorts in leading rides: I think there was some coaching there, without a doubt. They also got many more ride leaders, many of whom are very experienced in this sort of thing (though they clearly came from a bit of a activist/advocacy perspective, telling riders to "take the lane" - the police escorts were more concerned with keeping us all to the side and keeping traffic moving). The policemen were also very explicit about each rider's responsibility to shout out obstacles and that sort of thing. Publicize the ride better: Perhaps the least improvement here. There was a nice piece in the Globe last night, but that's a bit late to really get the word out for most newbies. It seemed like most riders were regular commuters, like last time. The Globe article was pretty good, though, and I'm in the picture that came with it! Communicate the ride better in advance: Again little improvement here. The emails were still a little convoluted, though the Google map with start times made more sense this time. The festa at the end also seemed livelier than last time, with more interesting bikey stuff to see. Had a nice bagel, and got a free T-shirt. I don't know how I neglected to blog this when it happened, but there you are. A few weeks ago, the family did a bike excursion that I'd been wanting to do for ages. Last year, we discovered a wonderful swimming spot in Bedford in Springs Brook Park. Complete surrounded by woods and fed by a natural stream (apparently), it's an odd combination of pond and pool, with a mostly sandy bottom and a cement zero-entry bit on one side. There's also a great spray park right there, which is easily as good as our usual spray parks in Belmont or Brighton. It later occurred to me that it's not too far from the Bedford end of the Minuteman Path, so I started thinking that we could bike there as a family. By that time, it autumn last year and we had to postpone that ambition to this year. And in the meantime, I also started riding the Narrow-Gauge Rail-Trail that starts just across the street from Bedford Depot and goes all the way to Billerica. It's mostly unpaved, but the surface is fine a commuting bike or our Christiania. So, if you follow that after the Minuteman path and turn off at Springs Rd, just follow Springs Rd for less than a mile and you're at the swimmin' hole! It's about 9 miles from Arlington Heights to Springs Brook, almost entirely traffic-free! Fantastic. The girls did great on the ride, and Elsie slept for most of the ride home. It's getting a bit late in the season now, but I really hope we can do the ride again this year and get some more swimmin' in! I was up early today so I did an extra ride to the end of the Minuteman Trail before my usual scenic route to work. Amounted to about 25 miles in full - not bad before 9:00! It was a bit chilly today, around 55 in Arlington when I left. The bike path was blissful, though. Lots of riders and runners out early. 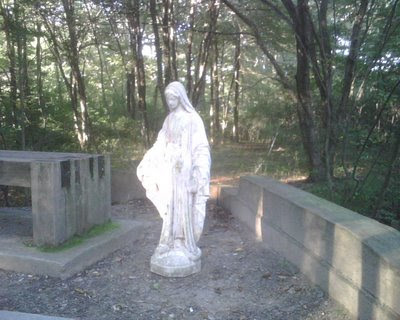 It also occurred to me to take a photo of the Virgin Mary, who appeared on the path not too long ago, near the Bedford end. Lauren says she's moved a couple times, but she's still where she was when I first noticed her. Still experimenting with our Flip video thing... It seems to be much happier producing simple videos from the PC version of the software than manipulating on a Mac. This YouTube video is cobbled together from the video I captured on the ride, and is only mediocre quality because of the various conversions it's had to go through. I edited it in iMovie HD. Way back in May, I found a book of Maine bike tours at a shop in Kittery (and wrote about it here). It was exciting because we have relatives up in Skowhegan and a couple of the rides are in that precise area. So when we went up for our August vacation this year, I was sure to bring my bike to try one of the rides. Of course, I forgot to bring the book along with me, but fortunately, the route is described in detail on the State of Maine website here. I opted to do the 41-mile loop, which starts from the Rite Aid in Skowhegan, only a couple miles from Auntie Lynne's house. It was a gorgeous ride, though some of the middle bits were on major roads and heavily trafficked. There are few errors in the instructions which I only managed to work out with the help of Google maps on my phone, but otherwise very smooth. Instead of taking the camera along or trying to capture the mountain splendor with my miserable phone cam, I brought our little Flip video camera and did a video, which I hope to cobble into something to post later today. I rode the Mount Washington Century on August 2nd. Fantastic! My good friend Lauren asked me to lead a group on behalf of her company Ciclismo Classico. But because the Pan Mass Challenge was the same weekend, and because of the late notice about the group ride, I only got one taker. Nevertheless, he and I had a fine time for the first ten miles or so, until he rocketed to the front of the pack. Still, it was a record time for me, and I think I have him in part to thank for getting me on a good pace from the start. The ride was EXCEPTIONALLY well organized, with numbers for each rider, ham radio support throughout (in the absence of a cell signal), and great food stops every 20 miles or so. I found that I never had to tap my second water bottle, let alone my stash of snacks. I blogged at each rest stop from my phone - real-time updates follow in reverse order. Phew! Super ride. Didn't get toooo wet. Then dried out and resoaked with sweat. 7 hours 54 mins, over 2 hours faster than my last century! Just 11 miles to go, but the rain has caught up with us. Almost 80 miles now, now feeling pretty beat. Hoping for lots of downhills. Menacing clouds looming. Bring it on! The end is in sight! Only a third to go! Since Bretton Woods, the roads have been more trafficked, and the scenery not quite so dramatic. Nevertheless, still feeling good, but glad to have only about 35 miles left. Which is what I ride on some commuting days. And feeling good! After a long steep ascent and fast downhill, the Bretton Woods Hotel was quite a welcome sight! Rest stop now and really great food. Very happy I didn't cop out and only do the 50 miler! And nary a downhill to be found. I expect to reach the summit eventually. Feeling good so far. Rode with the CC person until a mile or so back, nice time. Only 85 miles to go! My friend Lauren brought this ride to my attention and suggested that I might like to do it with other Ciclismo Classico folks.... But since no one else from CC is doing it, she asked me to lead it on behalf of CC. I'm just having breakfast now on my way to the ride. I don't expect more than a couple people to turn out in my group, though. The trouble is that this is also the weekend of the Pan Mass Challenge ride, and Ciclismo always has a sizeable contingent there. It's a little chilly this morning, and cloudy. Weather reports call for rain here and there. I left Gem, Elsie, and Kim sleeping at the North Conway Grand, where they'll spend the day. Shouldn't be hard for them to keep busy, since the hotel has 3 very nice pools, and it's right in the middle of a great outlet mall! I'm going to try to do blog updates during the ride today. Now to pay for my oatmeal and hit the road!